The Grand Rapids commercial landscaping professionals at Pro Cut Lawn Care & Landscape can provide detailed landscaping, routine maintenance, stone or paver walkways and snowplowing to enhance the look of your business, making it appealing to your customers. We make sure that first impression, even before they get in the door, is a positive one. We can deliver complex projects or low maintenance commercial landscaping designs, all within your budget. Pro Cut Lawn Care & Landscape offers year round commercial maintenance to keep your building or complex aesthetically pleasing throughout every season. A beautiful landscape creates an inviting appearance that reflects on the level of excellence you offer to all those who enter your establishment. It creates a positive environment that has the potential to improve your business, while demonstrating you care about your customers, employees, or tenants. That’s why we are honored when you choose the Grand Rapids commercial landscaping company, Pro Cut Lawn Care & Landscape to enhance your image through exquisite outdoor environments. 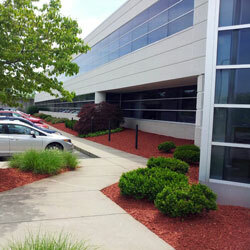 We will strive to enhance the look of your business, making it appealing to your guests or customers. Contact the Grand Rapids commercial landscaping experts at Pro Cut Lawn Care & Landscape today free estimate or call us directly at 616.421.4148.